Well....I have been after something like this for quite some time. 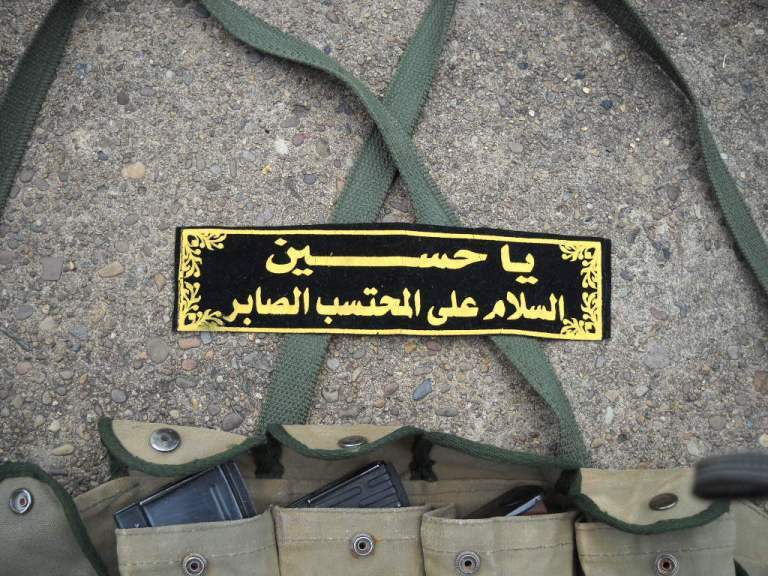 This is a heavily used Iraqi made AK chest rig (4 cell) and a portion of a Mahdi Army/Mahdi Militia headband. The chest rig is made of a HEAVY tarp material. 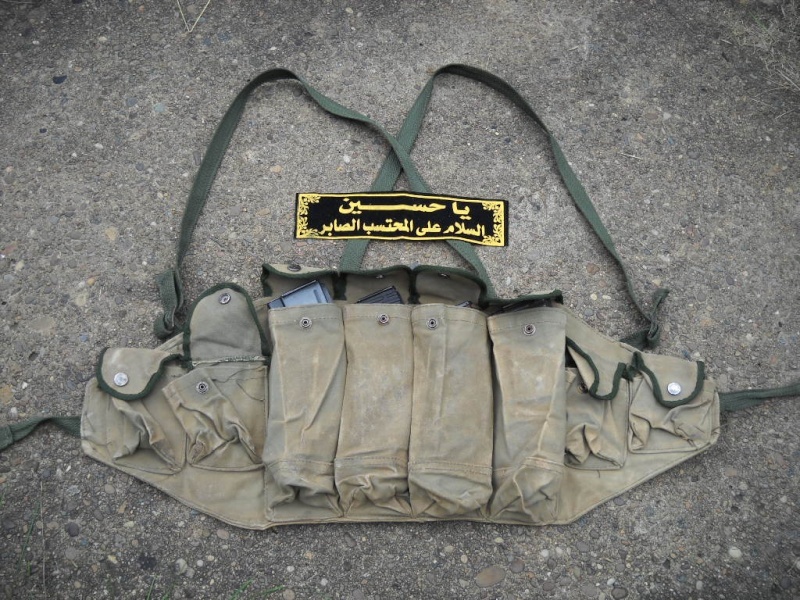 The material used is much heavier than any other Iraqi made AK chest pouch that I own. The headband is made of a velveteeen type material. Not sure if it is a headband or armband. Figuring I will never find an insurgent outfit, I may very well get this framed and display it on the wall. Hi Arch congratulations on these pieces Mate. Very nice pieces and interesting but equally disturbing history behind these insurgents. Thanks, Gary. It is indeed disturbing when you find out the history behind this insurgent group. Very violent. My 1st calvary friend, Michael Phipps who was in Sadr. He fought with the Mahdi Army. I bet it would display so nicely with his grouping! Arch, I went on searching for images and found this picture. Note: The headband has different arabic writing but characterstics are exact same. 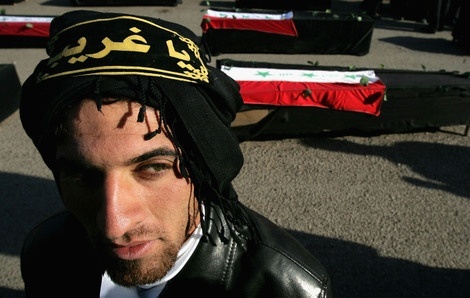 An Iraqi supporter of Shiite cleric Moqtada al-Sadr stands near mock coffins, symbolizing killed Mahdi army members, during a rally on February 21, 2008 in the Sadr city Shiite neighborhood of Baghdad, Iraq. Shiite cleric Moqtada al-Sadr is expected to announce within days whether to extend his Mahdi Army ceasefire or not. Al-Sadr declared a six month truce on August 29, 2007 which some Iraqi and US military officials claim has played a vital part in reducing sectarian violence. The six month truce is set to expire at the end of February. By Wathiq Khuzaie/Getty Images. 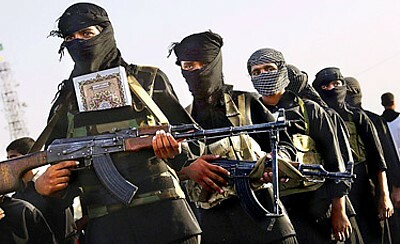 Above: Members of the Mahdi Army. Tensions have been rising for months between the two primary Shia militias known as the Badr Brigade and the Mahdi Army as each struggles for political dominance. The Badr Brigade is the paramilitary force of the largest Shia political bloc, the Supreme Islamic Council in Iraq. The Mahdi Army is the paramilitary force of the Sadrists, headed by Moqtada al-Sadr. The Iraqi security forces are heavily infiltrated by both, with each having varying amounts of control in different areas. Below: A scene from Sadr City. Al-Sadr has built his following from millions of the poorest Iraqis, and his organization has provided food, money and medical care when none else was available. ladrang wrote: Very nice pieces Arch. Thanks, Iadrang. Been a long time trying to find a grouping like this one. Very interesting stuff, Arch. I haven't seen too many items from the "other side" of this conflict. I have noticed the same thing as well. Since the insurgents didn't wear a uniform per se, you wouldn't expect to see those. I have seen plenty of AK chest rigs, RPG backbacks, mortar sighting devices, etc. However, you can never be 100% they are insurgent or Iraqi Army used. To be honest, this is one of the few insurgent grouping I've seen. Remind me Monday and I will get it translated for you. And fcuk the JAM..Jaiysh Al Mahdi. And Snaggle tooth Al Sadr!! Thanks, Mike. A translation would be great. Arch, according to one of my Iraqis the arabic is a general religious phrase/blessing towards the prophet Mohammads bloodline and his nephew Ali who was considered to be a rightful Imam in the Islamic movement according to the Shiites. Ali was murdered by others who thought that the succession of "command" should be based upon general consensus vs blood lines. Basically, this is akin to a soldier writing a prayer or other religious graffiti on his helmet, etc.. Thanks , Mike!!! I kind of figured it might say something like that and would be in line with the Mahdi Army ideology.. However, I am relieved it didn't say "Wal-Mart of Sadr City"!